Durga, goddess of power, eternity and tranquility. Goddess who lead us to the path of wisdom and galore. During my childhood days, Durga puja was the most awaited festival. It was the time when my whole family use to go for puja pandal (temporary shed) hopping. From one pandal to another admiring the decoration, the scintillating lights, the giant image of goddess, the flower works etc. As a child I used to jump up to the fence surrounding the awe image of Durga and used to look intently at her benevolent face. The colourful and huge backdrop, baskets full of colourful flowers and fruits, plate full of red, orange and yellow sindoor (silica powder), hypnotic sound of gong and the festive hum of the crowd each adding a different colour to my trans state. The great spear held in her raised hand and the demon being slaughtered, looked frightening. Yet,the divinity in the eye of the goddess was something that has always made me feel happy, safe and invincible. How lustrous and omnipresent she looked, her aura, her dark hair cascading in waves, her ten arms raised with effortless power and the calmness in her eyes, everything is mesmerising. In mythology, what happened with Mahishasura is a clear example of how men have discounted women and thus faced fatal consequences. Demon Mahishasura being vain, sought immunity only from men and gods, never ever considering the existance of women. When every other god failed to defeat Mahishasura, goddess Durga battled him single-handedly for continuous nine days and on the final day, she slit his throat with her trident. Such was the valour of the almighty Durga and the victory is till date celebrated as Dussehra across India. Dussehra depicts the power of women when every other power has failed to fight. The god did not consider themselves small in seeking help from a female (goddess Durga) or acknowledging her strengths. When god were willing to accept the incredible strength that a women has, why we could not? Why have women been labelled as weak? Why do people have so much trouble accepting the power women? Why women today are striving to get an equal level as that of men, when they already are? Ironically, today Durga is worshiped with pomp and splendor but women are considered weak and less competent. People try their best to make goddess happy during these nine days but take the women around them for granted. Why indulge in the hypocrisy of worshiping the female form? History testifies the fact that a women if challenged, can be fiercest creature you will ever see. There are hundred of times in a women’s life when she has been the emblem of courage and determination, that ray of hope and the ultimate resolve when all seems lost. If you talk about physical strength, child-birth is the prime example among others. Look around you, your mother, sister, wife, teacher, maid and every single female you know has fought a battle, battle of strength, battle of emotion and a battle of existance. But does not even wear the scars. 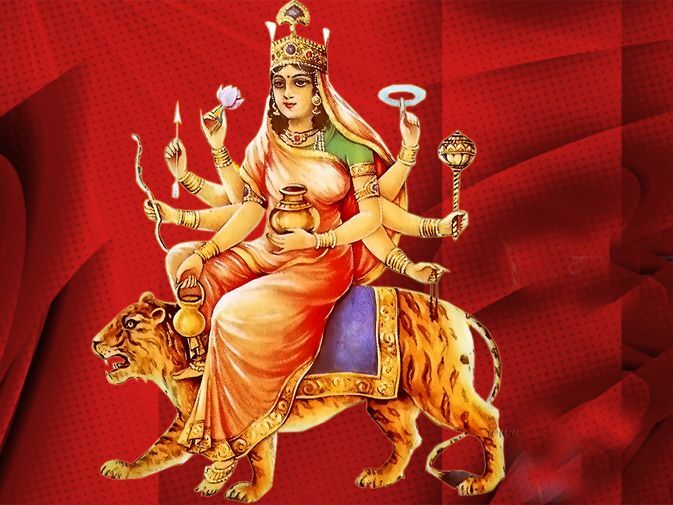 Each of the nine days of Navratri is associated with one of the innumerable forms of the supreme goddess that bears great resonance with different stages of a woman’s life and her position in the society. The first three forms depicts the transformation of a young girl whose identity depends on her parents, to an adolescent who perseveres to fulfill her desire and then to a grown up woman who has stepped into her new role of matrimony with finesse. 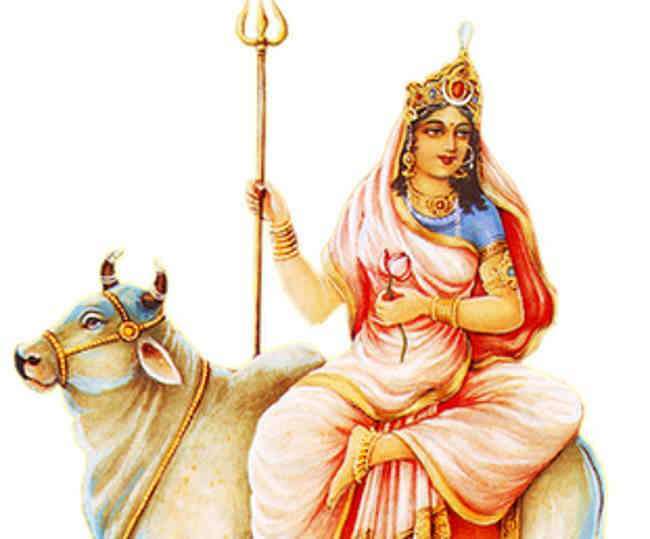 The first day is dedicated to Shailputri, the daughter of the mountains. The purity, the innocence on the face of Shailputri is like that of a child, the untouched and unadulterated heart. That is unaware of the demands and greed of the world. Shailputri is the first stage of every woman, when she is what her parents are. Pure at heart and leading the world with her innocence and tenderness. 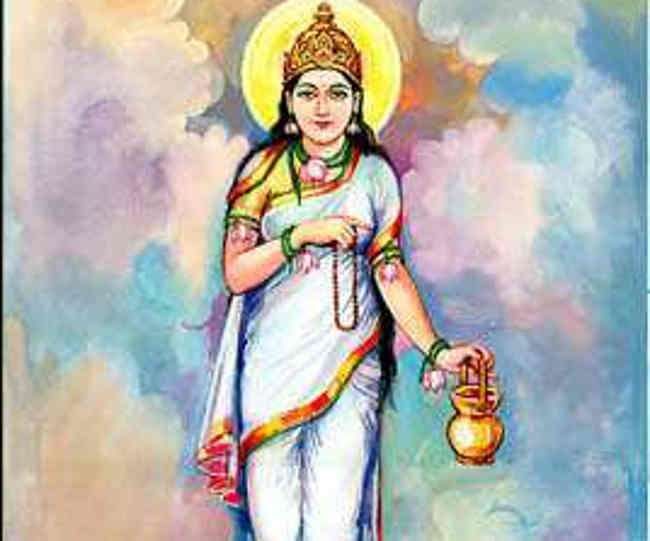 The second form is Brahmacharini. It is that stage of a woman life when she remains devoted to her career her studies. Every girl has a dream, a dream to succeed, to win, to face challenges, to fly and with the help of her parents, a girl devotes this part of their life to achieve all these dreams. 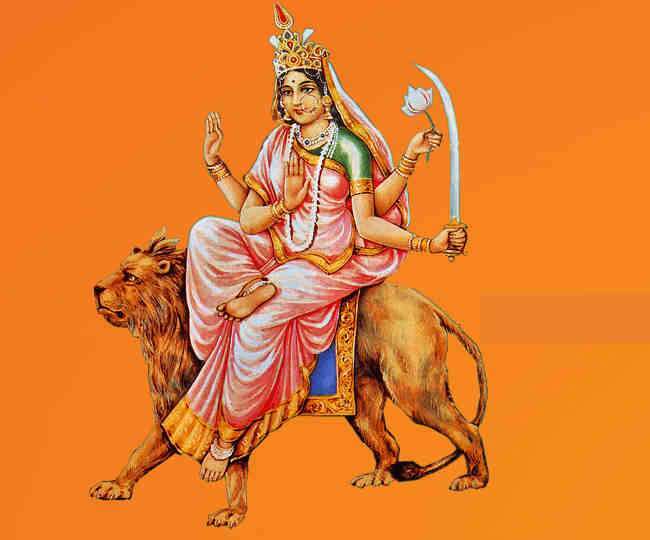 Third day of Navratri is dedicated to Chandraghanta, the goddess who is married and ride a tiger, carrying the weapons. She is believed to reward people with grace, bravery and courage. This form of goddess Durga depicts a woman in the stage when she is married. When she starts an all new phase of her life leaving a family that belong to her from the day she came into existnace. A woman does that with a grace. Being accepted in a new family is a daunting task and a woman remains in her cocoon for long. Searching for the same mulberry leaves as she had earlier is what every woman strives for. Everyone considers them strong and happy but truth lies far beyond. Like Chandraghanta, in this phase of woman’s life, her third eye remained open to see all odds and to tackle every situation with calmness and divinity on face. 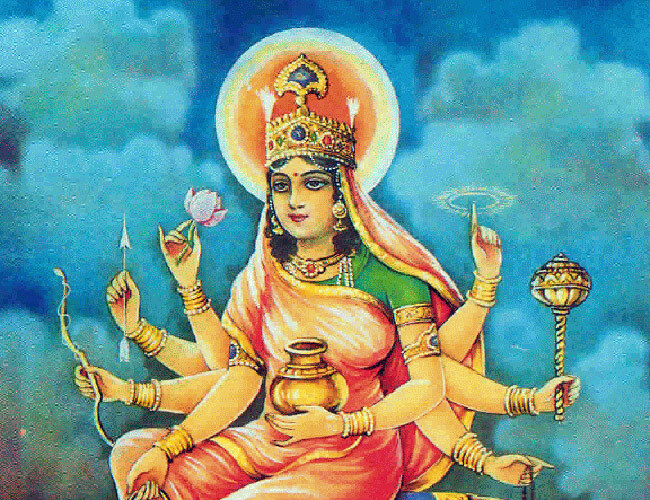 The next three forms – Kushmanda, Skandamata and Katyayani of the goddess reflects three facets of a woman’s social persona. Kushmanda, the goddess of fourth day, wears an enigmatic smile and shines with the splendour of the sun. She is the woman who has gradually mastered the ways of the world and is not only thriving but also sharing her magnificence with the entire creation. The stage when she finally decide to shine, to shine on everything that comes her way, to light up others and the path she walk upon. This is the phase of a woman’s life when she has fought her initial challenge post marriage and is sparkling again. Ready to face the world and shine upon. 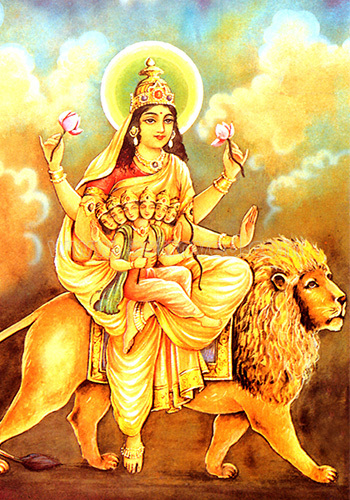 The fifth form of Skandamata shows the goddess as the nurturer, holding her infant son Skanda (Kartikey) in her lap, devoid of any weapons, yet riding a fierce lion. The stage of woman life, when she is blessed with a child. Birth of child gives tremendous power and strength to a woman. The strength to tackle everything and anything that comes in the way of her child and family. She is furious at one moment and calm on another. Every mother has the power to fight the world without any weapon just like Skandamata. The sixth form of Katyayani is associated with something momentous. She is the one who appeared as Durga to destroy the demon Mahishasura and her victory is the most depicted view in all Durga puja pandals. It highlights the inherent potential inside a woman- she is not just equal to men but is in fact superior. This is the stage of a woman’s life when she bears the power to care for her family and manages her professional life as well. Maa Katyayani symbolises the inner power every women posses. The seventh depiction is Kalratri, She is dark, threatening and has blood dripping from her fangs. Parvati, the beautiful wife who expertly balances her personal and professional life is transformed into dark destroyer Kali who does not give a hoot about how she looks or what social obligation she has to fulfil. She reveals she can become the destroyer for every demon that comes in her way. She can be fiercest if her family is at stake. She can go to any level to protect her family. 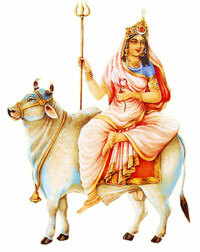 Kalratri returns to benign aspect of Mahagauri, the goddess of eighth day. Bringing respite to a bewildered world, she ride the bull that is the vehicle of her husband and holds his trident, once again showing the world that Shakti and Shiva are two different halves of the same whole. Incomplete with just one half. The final form of ninth day is that of Shiddhidatri. She holds the conch, lotus, club and discus in her four hands. She is the final form that has come gradually through evolution from a daughter to a lover to a wife to a mother to a wildling. She is the epitome of divine feminine carying with her the power to create and destroy. The Nav-durga, therefore depicts the stages of woman’s divinity and none of them is inferior to the other. Just as a woman taking care of her family is no less than the one who frequents the corporate boardrooms. This Durga puja lets take a pledge to not only worship the goddess Durga but also accept the incredible strength of Nav-Durga in every woman around us. Loved the way every aspect and character of Goddess Durga has been compared with the duty, responsibilities and actions of every woman. Every woman is fighting a battle and still keeping a balance between work and family. A must read article for every one. Very nice post !! The nine forms of goddess Durga is so related to a women’s life! Women should celebrate women hood!! Very very powerful narration, keep it up.Lovly prose written lucidly. Good, with blessings. Beautifully narrated each stage of a women’s life and how they are so comparable to the forms of Goddess Durga. The delicacy and strength within every woman is worth cherishing !! !